A taller and more robust twin of the Pinewood, the Hampton is available in softwood with mortice and tenon joints and pressure treated for long life with Osmose giving a light green finish. Further treatment should not be required, retreat for aesthetic purposes. 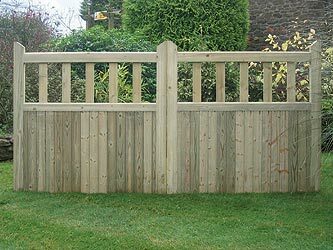 Recommended Gate Post size 5" x 5" and for height allow for 3ft 6ins more than the height of the gate for burial purposes.